Charters last 7 days and 6 nights, starting 8 AM your first day and ending at 4:30 PM your last day aboard. Price for two guests $12,500. $2500. to reserve your charter. Balance due 90 days before charter start date. Deposit is refundable up to 90 days in advance. ​Extended trips and itineraries can be arranged. .Fresh Silver Salmon just out of the salt and sugar brining solution will be smoked over alder wood chips for an hour, then put up in canning jars. The Silvers usually start to run in Kodiak mid to end August. King Salmon can be found in the spring. Halibut, Cod and Rock Fish all the time. "My wife, Susan, and I have recently returned from a one-week trip on Samba with Josh and Natasha Tofield and their golden lab, Loxie. Eric Leishman at PAE told Susan and I that he was sure we would have a great time on Samba, and he was right. was incredible, and we had lots of time to fish and observe nature. Samba is a well-laid out, exceptionally equipped, Nordhavn 52. The Tofields have taken great care of their boat, and it is reflected in her appearance and how well she operates under their leadership. The equipment and redundancy on Samba is first class. Safety is number one, and this is stressed from the beginning. Josh and Natasha spent an extraordinary amount of time showing us the boat, its systems, and how and why they work. Josh had prepared a comprehensive curriculum, and he covered all the points thoroughly and answered all of our questions patiently. Natasha’s food was wonderful in all aspects. 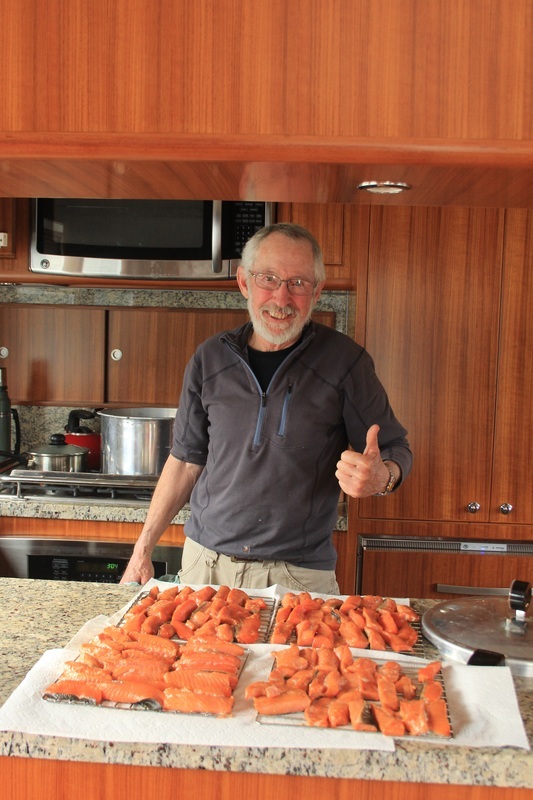 Homemade bread, cookies, salmon, halibut, rockfish tacos, fresh-picked mushrooms and even venison which was well-grilled by Josh added to our enjoyment—and to our waistlines. My wife and I would not hesitate to recommend spending time on Samba to anyone who wants training and experience aboard a Nordhavn. Feel free to contact us if we can answer any questions. The portion above was written by husband, but I wanted to add a bit in case there are any partners in my position. I am not crazy about boats at all. I am just crazy about my husband. If not for him, I would probably rarely (or never) be found on a boat again. Although I have supreme confidence in my husband, I have a lot of fear and uncertainty—-and I certainly felt confidence in Josh and Natasha. The safety with the set up on Samba, their knowledge, and the protocols they practiced were just exceptional. I felt like I was in the best of hands. Samba is beautifully maintained and very comfortable. As Ward said, Natasha’s food was yummy! Josh and Natasha really care about teaching and giving their guests a week to fondly remember. The Tofields have so much knowledge which they generously share, and they are also two of the most gracious people I have ever had the pleasure of meeting. Loxie, their lab, is beyond words! I am so grateful for the week we spent on Samba. It was such a beautiful and unique experience."